Some of these are modern classics, or children’s classics, or feminist staples. One way or another they are classics that sound interesting enough for me to want to read them with actual enthusiasm, rather than “just because they are classics”. We by Yevgeny Zamyatin – I love 1984 by George Orwell (and dystopia stories in general) and this book is said to have inspired Orwell’s. Plus, it is Russian Literature, which is something I never read before. I already bought it and it is fairly short, so I should come to read it soon. Fahrenheit 451 by Ray Bradbury – Another classical dystopia and about burning books. I love books that discuss the importance of books, so this one is on my list, for sure. Brave New World by Aldous Huxley – And yet another classical dystopia. This is one is more of a fake utopia situation, which sounds really interesting. As in, is living life in a perfect way really all that good? To Kill a Mockingbird by Harper Lee – To be perfectly honest, I am not sure what this one is about. I know it is about high school (I think?) it has been mentioned on certain books that I have also loved, and it won a Pulitzer in 1961. The Princess Bride by William Goldman – I love the film adaptation of this and I just need to read the story that inspired it! The Diary of a Young Girl by Anne Frank – This is a non-fiction classic, set in World War II. I used to be about weary about historical novels (fiction or no), but after reading The Book Thief, I am more open to it. Those are such important stories to experience. I just know this is going to make me really sad, though. Matilda by Roald Dahl – Can I be honest? Up until a few months ago I didn’t even know that films like Charlie and the Chocolate Factory and Matilda where actually book adaptations. It sounds pretty dumb, but since I live in Brazil, this books weren’t really a part of my childhood. I loved Matilda and really want to read the story now! The Color Purple by Alice Walker – This is about women of color, written by a woman of color (the first African-American woman to win a Pulitzer Prize for fiction – in 1983). Again, another important story to understand other cultures a little better. The Handmaid’s Tale by Margaret Atwood – When I first read the synopsis for this one I thought it was the scariest thing ever. A world in the future where women are only valued for their capacity to give birth and can’t even learn how to read? Despite being terrified, this is clearly a feminist book and I’ve been hearing great things about Atwood, so I’d like to start reading her works. The Bell Jar by Sylvia Plath – Another feminist classic, and this one contains poetry, which is something else I’ve been looking to read more of. So what were your Top Ten this week? Have you read any of the books I mentioned or are interested in them as well? Which one should I read next? Another post for the 2015 discussion challenge. I have trouble enjoying stories without a prominent cast of female characters. Of course a lot of books have very important females. But you know what I mean, I want a cast. I want female characters interacting with each other, having meaningful family bonds, friendships, etc with other females. I don’t want them to just be there as an important person for the male character. Or sometimes even as a device for the plot, to move it forward, or to motivate the male lead when they die. I want them to be important to themselves. I mean, obviously this is not necessarily the book’s fault. Some books/movies/tv are going to be about boys and maybe that’s just not for me. And even with books where girls are the main character, this problem still seems to occur, because the rest of their world is filled with boys. They are surrounded by love triangles, boy best friends, love interests that consume their whole life and the only relationships they seem to have with other girls are tainted by jealousy and hate. Obviously I am over generalizing, there are great books out there who aren’t like that. But a lot of them are. Also I don’t like the idea that “if you want to know if a female character is important/has a good story arc/a good personality/whatever, than pretend she is a man and see if it works”. This is meant to identify points in which a female character is being poorly constructed. Can I just? NO. Ok? NO. Let’s not write stories thinking like that. This just reinforces the idea that male is the norm. Let’s eliminate that. Females should be valued for who they are as individuals and not for how they are in comparison to a man. So what do you think? Are books like that a reflection of the way or society thinks? Are females under appreciated in fiction because they are so in real life? Should we be writing and reading books with more female characters in the general cast (and not just “the only girl in the group” lead)? 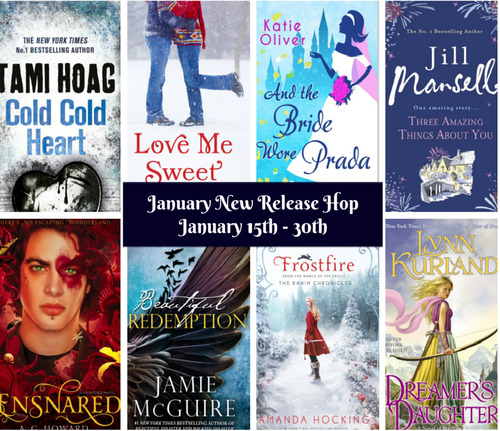 The January 2015 New Release Giveaway Hop hosted by Librarian Lavender! I’m giving away a January 2015 new release book of your choice (it doesn’t have to be on the picture below, as long as it is a January 2015 release), up to $20. This giveaway is international. I’ll probably ship through BookDepository or Amazon, depending on your country. Or if you prefer I can give a gift card or send an ebook. Whatever works best for you. -Must be 18 or older or have your parents permission to have strangers (me) sending you mail. -I’ll e-mail the winner and they will have 48h to respond with their address and book choice. 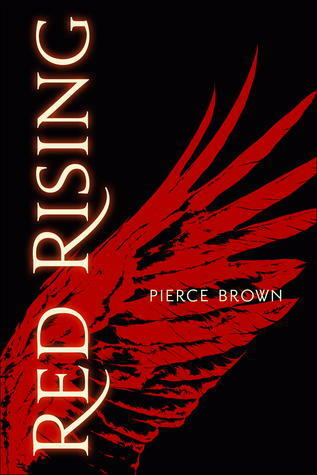 The sole reason I wanted to read Red Rising was because it was set on Mars. I didn’t really need to know anything else. I was expecting major science fiction stuff: the discovery of planets, terraforming, space ships, the works. But the book isn’t really like that. It is more of a dystopian, and honestly it couldn’t have been set on Earth or anywhere. The Mars aspect didn’t really matter the way I was expecting it to. Not that the setting and description weren’t great, but it was not necessarily “Mars” in my opinion. It could have been somewhere else. This story is about Darrow who is a Red, a race (an aspect apparently defined by hair and eye color, though that isn’t very clear) of slaves who works mining the subsoil of Mars in order to make it inhabitable for Earth citizens. However, he soon finds out that all his life had been a lie and that Mars has been inhabited and fully functional for centuries. The Golds, the so called superior race, live among the surface, controlling all the other colors (almost every shade is mentioned on this). Now Darrow must become a Gold and exert his revenge, freeing the society from the dictatorship of the colors. This is just a short synopsis. This story gets really complex and it involves a “Hunger Games” style sort of school competition throughout most of the book. Overall it was a great concept and it had a ton of action and a good political comment. Unfortunately, it wasn’t exactly a favorite for me. First of all, there was too much info dumping, confusing names, there’s greek/roman mythology thrown here and there without any clear meaning besides the superficial “certain Gods with certain qualities”. The world is full of strange phrasing and different words that in my opinion weren’t really necessary. You get used to it eventually, but in the beginning it is hard to get into. The situation per se is not difficult to comprehend, but the dynamics of the colors (how they came to be this way, the colors of their eyes, what are their skin colors? is it varied?) and the nuances of the world just aren’t clear enough. I wouldn’t say underdeveloped, because it isn’t. But it is not very easy to grasp. Maybe that will be clearer in future books. As for the action scenes, there were just way too many, and with no emotional charge, which is not the kind of thing I personally like. I found myself skimming some of the battle scenes. They are boring to me. This probably won’t be a problem for everyone, though. If you like battles and war strategy, I would say this book is for you. But I’m not really into that. It took me unusually long to read. Maybe it was because I didn’t have a lot of time, but still, it wasn’t constantly good. Some chapters made me want to keep going and were exciting, while others were just meh. Another thing is that I didn’t really connect with any of the characters, I just didn’t feel like most of them were really developed. They were just names on a page. Even Darrow, though the story is from his POV, felt a little two-dimensional for me. The story is just more focused on plot and action, which is not bad, but it shouldn’t steal light from character development. Overall, it was an enjoyable read, just not my favorite. I do want to read the sequel, Golden Son, but I think I’m going to wait until it gets an ebook deal or something. What about you? Have you read this book? Did you like it? If you haven’t read it, does it sound like the book for you? I had about a billion series to choose from, but I was able to narrow it down, just barely (if this included series I wanted to continue it would have been crazy). Mistborn by Brandon Sanderson – everyone raves about Brandon Sanderson and I want to get into more high fantasy. 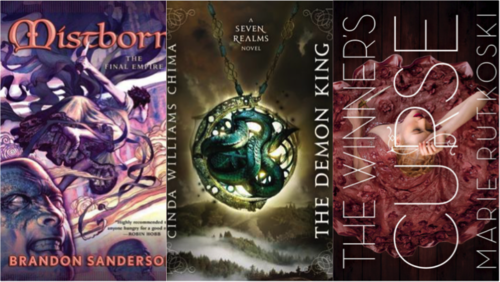 The Seven Realms by Cinda Williams Chima – another high fantasy, and I read the beginning of the first book and it sounds like a great one! The Winner’s Curse by Marie Rutkoski – romance and dystopia. Sounds like everything I always read, but it sounds great! 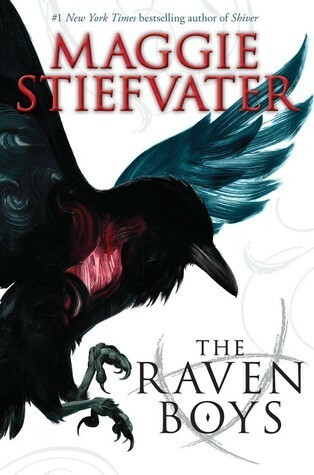 The Raven Boys by Maggie Stiefvater – this series is intriguing. I have no idea what it is about and I would like to go into it blind. 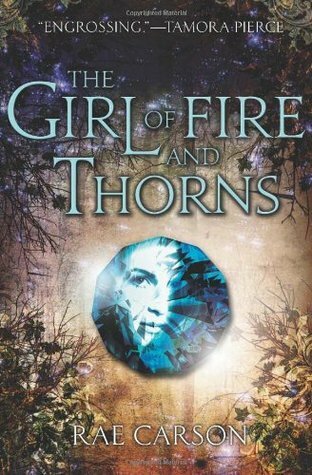 The Girl of Fire and Thorns by Rae Carson – High fantasy, strong female lead. What more do I need? 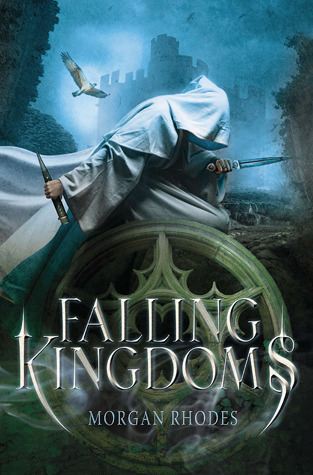 Falling Kingdoms by Morgan Rhodes – I heard this is like Game of Thrones YA. A lot of people rave about it, and it seems to have multiple POVs and ships, which I’m always up for! 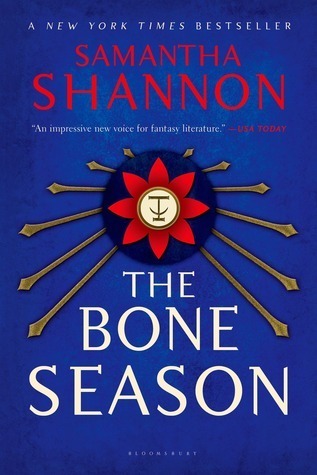 The Bone Season by Samantha Shannon – This one is about people with multiple super powers and it crosses the line between fantasy and sci-fi! 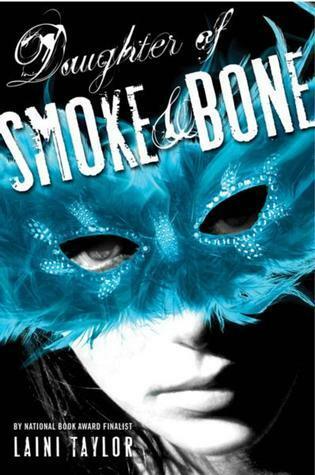 Daughter of Smoke and Bone by Laini Taylor – This series needs to happen! I think it’s about angels and demons, the main character sounds great, and the reviews are raving! There you go! What are your top 5 series to start this year? Any match mine? Comment your favorites or reblog if this series are in your list! Also, if anyone has read any of these: which one should I definitely get started sooner? Alex as Well by Alyssa Brugman – A moving story about a transgender/genderqueer teenager, told in an unique point of view. Sounds heartbreaking and I really want to read it! Expected January 20th. Fairest by Marissa Meyer – Hello! A prequel to the Lunar Chronicles about Queen Levana/the Evil Queen/the villain of the story? This is everything I ever wanted in life. And it has full color art and an excerpt from Winter (the series finale)! Expected January 27th 2015. I really, really, really want to get to these this year. Don’t Touch by Rachel M Wilson – “A powerful story of a girl who is afraid to touch another person’s skin, until the boy auditioning for Hamlet opposite her Ophelia gives her a reason to overcome her fears.” This is just an awesome premise and I am really intrigued. A Thousand Pieces of You by Claudia Gray – “When Marguerite’s father is murdered, the killer—her parent’s handsome and enigmatic assistant Paul—escapes into another dimension before the law can touch him.” Parallel universes? I’m there! Side Effects May Vary by Julie Murphy – What if you’d been living your life as if you were dying—only to find out that you had your whole future ahead of you? Cool idea, right? I also like that the main character is apparently really unlikable. Maybe Someday by Colleen Hoover – At twenty-two years old, Sydney has a great life: She’s in college, working a steady job, in love with her wonderful boyfriend, Hunter, and rooming with her best friend, Tori. But everything changes when she discovers Hunter’s cheating on her—and she is left trying to decide what to do. People have gushed about Colleen Hoover and this book so much. I really want to read it. It seems to be very emotionally charged, so I am up for that. Uninvited by Sophie Jordan – Davy doesn’t feel any different, but genes don’t lie. One day she will kill someone. Another great premise and I’ve seen all good reviews. Illusions of Fate by Kirsten White – The synopsis doesn’t really give much away, but just the fact that it is a stand alone fantasy (and the mention of Downtown Abbey feelings). Never read this author before, but this one sounds like a good start. The Strange and Beautiful Sorrows of Ava Lavender by Leslie Walton – Ava—in all other ways a normal girl—is born with the wings of a bird. I mean that sentence is enough to make me want to read it. I also heard it is a very lyrical book and it has family dynamics and religious obsessions. Since You’ve Been Gone by Morgan Matson – Right before what should have been an epic summer, Sloane just… disappears. No note. No calls. No texts. No Sloane. There’s just a random to-do list. On it, thirteen Sloane-selected-definitely-bizarre-tasks that Emily would never try… unless they could lead back to her best friend. I want this one because I loved Matson’s Amy and Roger’s Epic Detour and I love lists! Anatomy of a Misfit by Andrea Portes – This emotional, hilarious, devastating, and ultimately triumphant YA debut, based on actual events, recounts one girl’s rejection of her high school’s hierarchy—and her discovery of her true self in the face of tragedy. A high school romance, but it seems like it is about more than that, about self discovery as well. And it has been optioned to be a movie. Falling into Place by Amy Zhang – On the day Liz Emerson tries to die, they had reviewed Newton’s laws of motion in physics class. Then, after school, she put them into practice by running her Mercedes off the road. This has also had great reviews, and it is the story of a suicide attempt and it seems like it has multiple perspectives and some mystery. And also – physics! It is set right after the end of The Unbound and told from Wesley’s POV. It is really short, but a nice read if you like this series. It is one of my favorites. I want to reread both books at some point and I really hope there comes to be a third book. 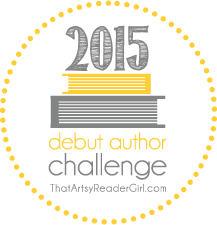 I’m participating in a lot of exciting reading and blogging challenges this year. To improve my reading, as well as to kick off the blog. And also, to have fun! 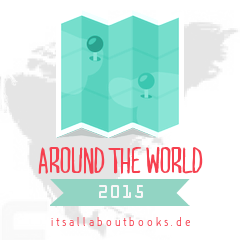 Around the World is a Reading Challenge created by the blog All About Books (click the button to go to the challenge page). Basically, you keep a track of the places you’ve been to though books on this google maps. And there are also fun mini-challenges (some are quite daunting). I’m attempting all min-challenges (not very rigorously, just to see how much I can do). Here is my challenge page and map. This is a fun reading challenge hosted by the blogs Alexa Loves Books and Hello, Chelly (click the button for more info). 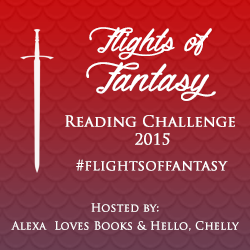 Basically you just pick a certain number of fantasy books to read during 2015. No specific rules other than that! 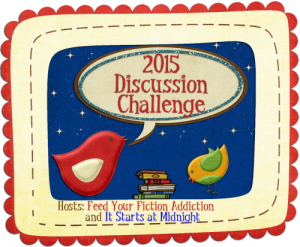 The 2015 Discussion Challenge is run by Feed Your Fiction Addiction and It Starts at Midnight. It is basically a challenge to blog more discussion posts! I want to post at least one discussion a month (not being to ambitious with this one), so I am going for the Creative Conversationalist goal (about 13 discussions at least). I’ll keep track of the posts on this page. Hosted by Reading Wishes and Rather Be Reading. 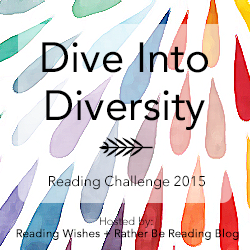 It is basically just a challenge to read more diverse books. I’ll keep track of my diversity posts and reviews on this page. 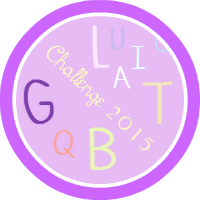 This challenge is run by Niji Feels (click the button to go to the challenge post). It is meant to encourage the reading of LGBT books. 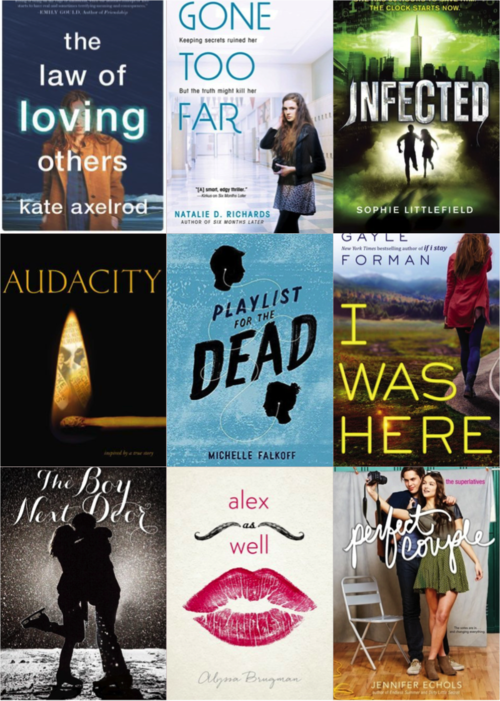 My goal is the YA DEVOURER: to read 10+ YA LGBT books. I’ll keep the progress on this page. This a challenge hosted by That Artsy Reader Girl. There are a lot of debut authors I want to read this year, so I’m really excited for this one. I’ll keep track of my reviews on this page. There it is! I’ll update the blog with my progress, as well as those specific organizing pages. It’s gonna be fun!